You may not relate Buddhism to India, but you will after reading this page! I was surprised to find out that it actually originated in the eastern part of the Indian subcontinent. This means the religion was created in or near India, in the sixth century, by a man named Siddhartha Gautama. 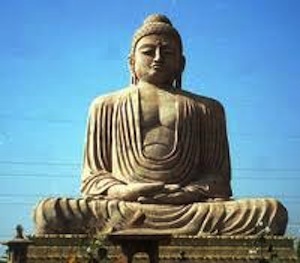 Gautama is also referred to as Lord Buddha; Buddha means “one who has been awakened." There are arguments about the exact area in which Buddhism originated and no one knows for sure. It is widely believed the religion was born in Nepal, but some believe otherwise. Buddhists believe that Siddhartha Gautama was not the first Buddha, nor the last. They believe he was one of many great teachers who have graced the earth, and who will continue to do so. A Buddha is really a person who is able to reach enlightenment and who, upon reaching enlightenment, receives the title of Lord Buddha. The Buddhist's religion is specifically based upon Gautama's teachings. Buddhism, is the fourth largest religion in the world; Christianity, Islam, and Hinduism are the first, second and third. It is estimated that the Buddhist religion has more than 370 million followers worldwide, most of whom live in Asia. In India today, only a small percentage of Buddhists reside in India. Like Hinduism and Jainism, this is a Dharmic religion, which means its followers believe in Karma. Karma is the belief that one's cumulative actions in life are taken into account and determine what someone will come back as in a later life. Followers of Dharmic religions also believe in reincarnation, which is the belief that a soul is born into a body, lives and dies within that body, and then is born again. Above, is a popular artistic depiction of Buddha that is often seen in Indian Art. Buddhists perceive this cycle as a form of suffering. So, Buddha's teachings offer his followers the enlightenment and the opportunity to awaken and to end their suffering by stopping there reincarnation cycle. Buddha teaches followers that if they live by Dharma, they can achieve Nirvana, which is freedom from the reincarnation cycle. Unlike most religions, Buddhism doesn't have a single sacred scripture that is followed by its various branches and traditions. Some Buddhist branches find certain texts to be cornerstones in the establishment of their religious values, while other branches do not. Today, the majority of Buddhists reside in Sri Lanka and many other Northern Asian countries. Two things set Buddhism apart from other India Religions: The first is that Buddhists do not recognize or worship a god whatsoever; the second is that Buddha does not teach of the existence of a human soul. It has two primary branches called Theravada and Mahayana. Theravada is the older and more dominant branch, and it is very popular in South Asia Sri Lanka. Mahayana is found mostly in Northern Asia. Both branches are strongest within the Asian continent, but can be found all over the world today.